Somebody who knows me, though obviously not too well, recently described me as having been "born in the wrong century." He suggested that I would have preferred the nineteenth to the two I've encountered so far. Make no mistake, I love the aesthetic of the nineteenth century. The whole of it, really, including the nearly four decades that preceded Queen Victoria's hopping up on the throne. I love the filigree at the dawn of it, the classical severity at the middle, and the coppery hammered sunshine at the end. Beautiful? Yup. Sure. So are sharks and electrical storms. I prefer to admire all three in the same way -- from a distance. Distance allows me to pick and choose the bits I like best. Dentistry, no. Medicine, no. Rampant colonialism, no. Itchy underwear, no. Needlework, yes please. This column has always focused on knitting, what with this being a knitting magazine and all. But there's little the nineteenth century created with needles that doesn't make my heart flutter. Even when the Victorians were tacky -- and they often were -- they were seldom dull. Take embroidery. Embroidery is an old love of mine. I taught it to myself as a boy, in secret, long before I learned to knit. 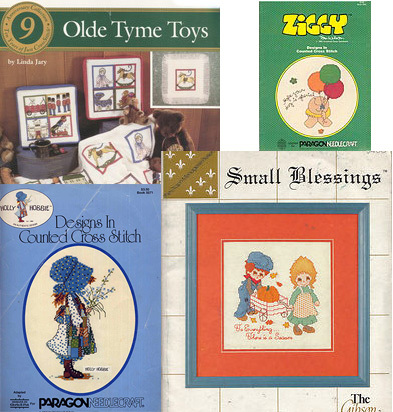 I grew up watching my mother do cross stitch. Her work was meticulous and skillful, but she was hampered by the charts that were available to her in the late 1970s and early 1980s. That period will never be looked upon as a boom time for needle arts. The popularity of handwork dipped sharply and the purveyors of floss and canvas (just like their colleagues in yarn and needles) attempted to keep the business on life support by making patterns hipper and hipper and simpler and simpler and stupider and stupider. Most ironic, perhaps, was the rash of "olde tyme" samplers, an outgrowth of the mania for rustic Americana. They were designs for adults to work, in imitation of samplers produced by little children a century before, but they were crudely colored and hideously oversimplified. What had been an educational exercise for tiny girls in 1850 was considered too difficult for a grown woman in 1976. I could never figure that out. Usually the explanations in the books spoke of how nowadays, we were just too busy to do fine work. What were we too busy doing? I was there in the '70s and '80s, kids. All I remember a lot of television. Most of it was as blockheaded as the needlework. And there was a craze for aerobic exercise, too. That's what we must have been busy with -- aerobics. That's why we're all in such great shape now. The first genuine 19th century needlework patterns I found were for filet crochet. I tried, and failed, to teach myself to do it, because I was dazzled by how pretty the charts were. A flower in one of my mother's modern charts was a stick figure -- crude as a child's drawing but without the charm. These flowers -- even the simplest -- had a certain lively elegance. They were complicated enough to be interesting. 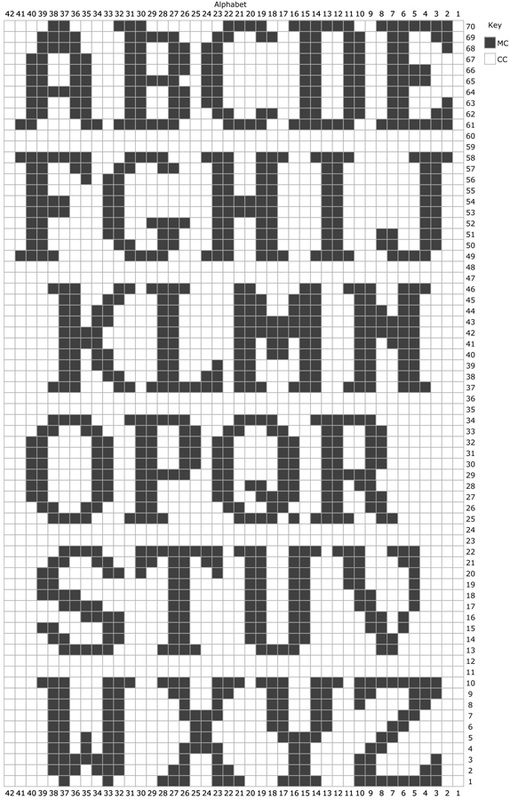 I gave up on crochet, but I realized you could also use the charts for cross-stitch. I couldn't take the books out of the library and the photocopier was too expensive for a kid getting a dollar a week as his allowance, so I spent fifty cents (half a week's salary!) on a tablet of graph paper and spent hours copying the charts by hand. I wish I still had them, but those charts are long gone. So are the little bits of embroidery I worked with floss purloined from my mother's supply (sorry, Mom) and pieces of her leftover canvas, fished out of the trash. But there are consolations. Albums, scissors, and reproduction cloth tape measure from Sajou. 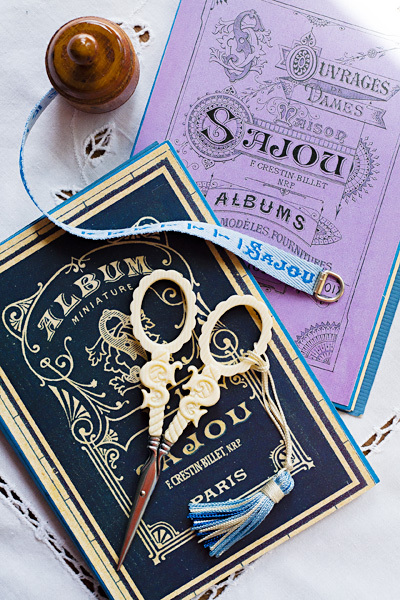 One of them is Sajou, a French needlework company that was founded in 1828 and shuttered fifty years later. 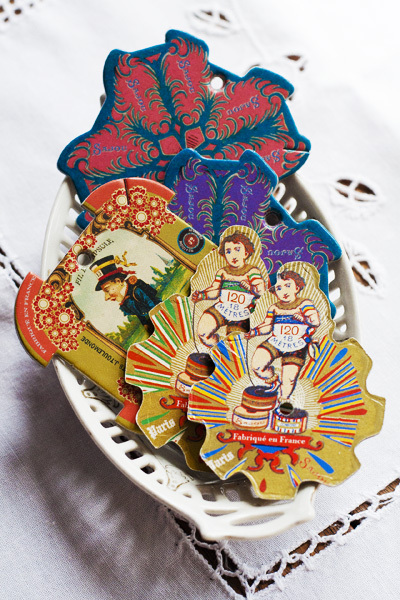 Jacques-Simon Sajou's products (which supported embroidery, plain sewing, bobbin lace, and crochet) were notable not only for their high quality but also for their beautiful design and packaging. Nothing with Sajou's name on it -- even humble items like thread cards (see photo at right), made for winding thread or floss that had been sold in a hank or skein -- was so workaday that it couldn't be made beautiful or amusing. Sajou also produced multiple series of teeny-tiny albums full of charted designs for embroidery (see below right). Some are full of alphabets, from plain to eye-popping, for marking linens or clothing. Some are filled with elaborate borders -- floral, geometric, architectural, fantastic -- or motifs that cleverly construct elegant nosegays, religious symbols, animals, and people (including scenes from Grimm and Perrault) out of little squares. Not one of them is boring. This is a knitting column in a knitting magazine, of course; so why all this talk of embroidery? It's because the charts have been calling to me again. But I don't get paid to embroider, I get paid to knit. 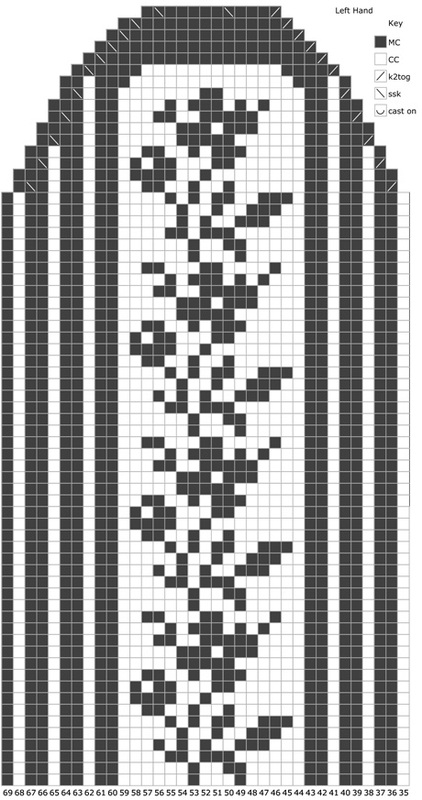 I thought, why not scratch both itches by adapting Sajou charts for knitting? 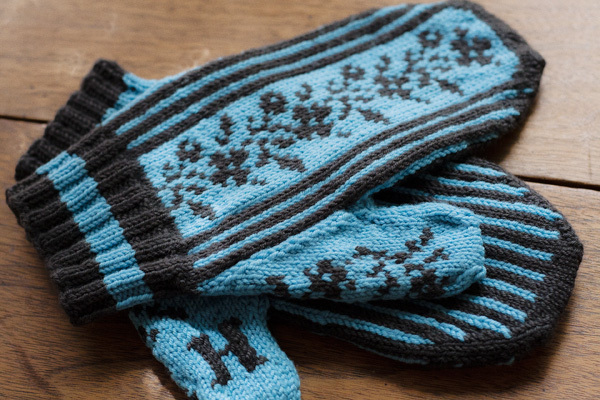 There's nothing fancy about the structure of these mittens, you'll note. They're pretty standard mittens. 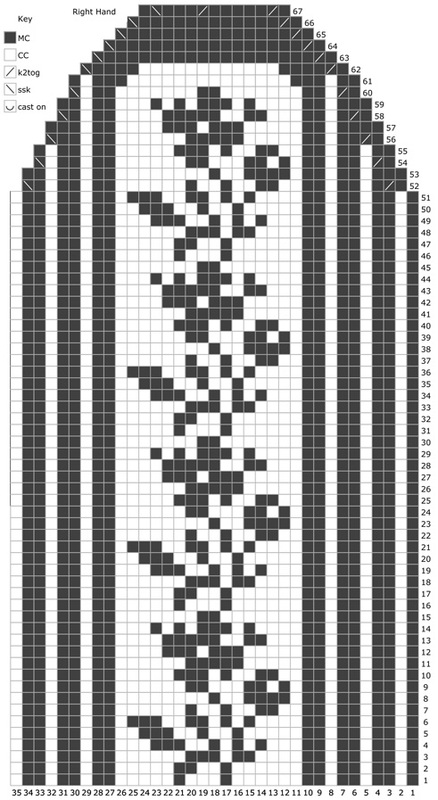 The reason for the "Piquant" difficulty rating is that you'll find that charts designed for embroidery often present special challenges in knitting. For example, they lack the repetition across a row or round that allows you to fall into a rhythm of three blue, two black, three blue, two black or whatever. You keep your eye on the chart, or you get lost. So keep your eye on the chart. And they aren't designed with the state of the wrong side in mind. Stranded knitting always leaves strands of unused color across the wrong side -- hence the name. (For a full discussion of stranded colorwork, look here). Strands (also called floats) that are very long are prone to catch and tangle. 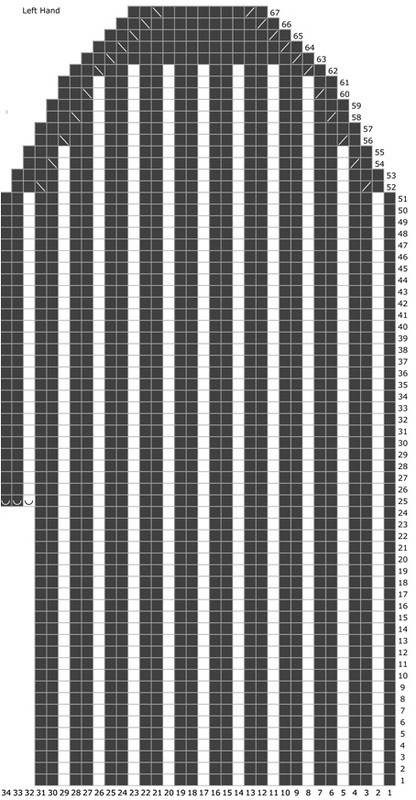 Charts for knitting usually account for this by making sure you never have a run of more than one inch of a single color before the color changes again. Since Sajou's chart designers didn't have to worry about floats, they freely invented motifs that let the colors fall where they may. It is possible to render them in knitting, but you'll need to keep the state of your wrong side in mind at all times. When you encounter a stretch of plain color that's eight or more stitches wide, you'll want to twist your yarns halfway across to keep the floats nice and short. This is especially true in the thumbs. Is the extra trouble worth it? I think so. One of the hazards of knitting pattern design is falling into a rut. I think my last ten pairs of mittens have featured some genus of repeating, geometric snowflake. Here in Chicago, we are more than plentifully supplied with real snowflakes from October to May. I hope these florals will make a nice break from routine. *If you consider "Bless This Mess" to be witty. **Or R on the right mitten and L on the left, if you're easily confused. Note: yardage for both colors cuts it very close. I strongly recommend you buy an extra ball of each as insurance! Avoiding Long Floats: There are numerous points in the charted patterns during which the unused color is liable to make uncomfortably long floats across the WS. To avoid this, whenever a stretch of 7 sts or more of one color is encountered, take care to twist the working yarns about halfway across. 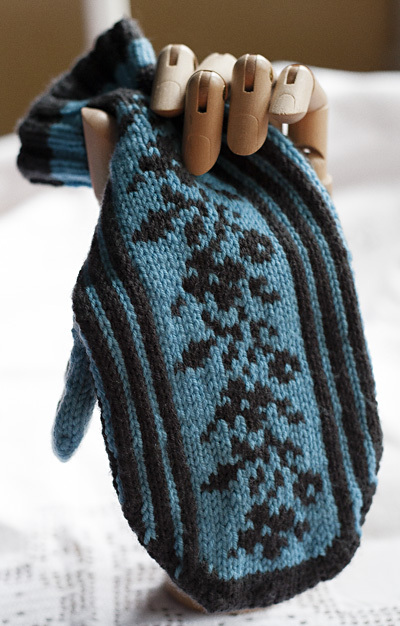 Charts: The right and left mitten are not identical; take care to work each mitten from the proper chart. 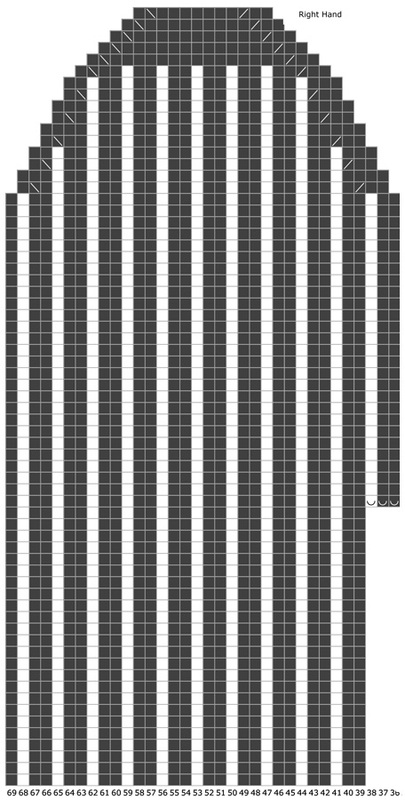 Click below and print each resulting page. For Hand charts, print both left and right sides, and assemble. With MC, co 56 sts. Distribute sts across needles as you prefer (28 per needle for magic loop/2 circulars, and a multiple of four sts on each needle for DPNs). Join to work in the round, being careful not to twist. Note: In rounds 8-18, the unused color is not cut, but carried gently inside the work until needed again. Rnds 1-7: [K2, p2] around. Rnd 8: Join CC. Knit. Rnds 9-14: With CC, [k2, p2] around. Rnd 15: With MC, knit. Rnds 16-21: With MC, [k2, p2] around. Rnd 17: With MC, [k4, m1] 14 times. 70 sts. Rnd 18, Left mitten only: With MC, k31, pm for start of thumb gusset, k4, pm for end of thumb gusset, k to end of round. Rnd 18, Right mitten only: With MC, k35, pm for start of thumb gusset, k4, pm for end of thumb gusset, k to end of round. Note: It's helpful to have the thumb gusset stitches grouped together on one needle. 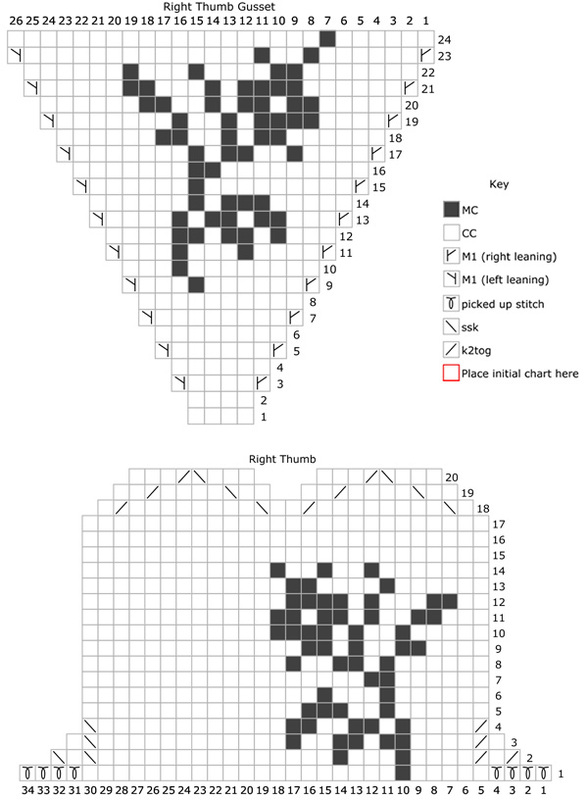 For Left Mitten, work Left Mitten chart sts 1-31 to first marker, work Left Thumb Gusset Chart to second marker, work sts 35-69 of Left Mitten chart to end of round. 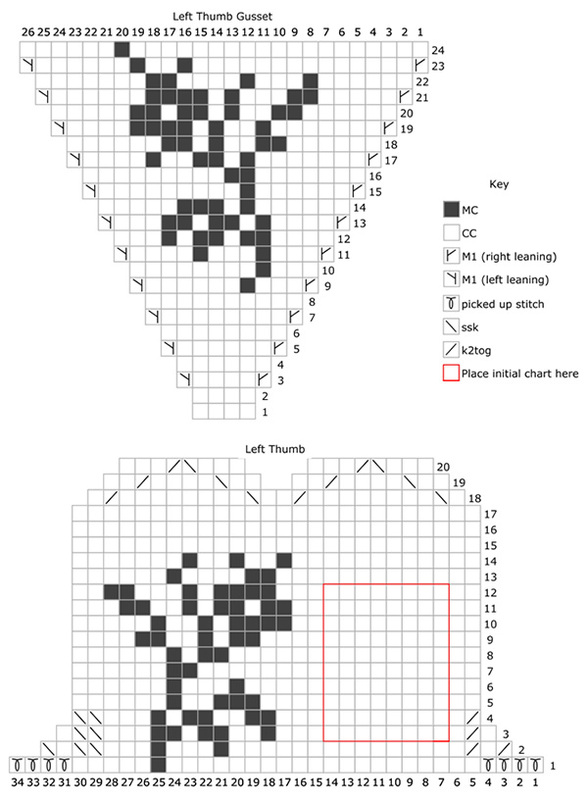 For Right Mitten, work Right Mitten chart sts 1-35 to first marker, work Right Thumb Gusset Chart to second marker, work sts 39-69 of Right Mitten chart of end of round. Work as set until 24 rounds of pattern are complete. 26 sts for thumb gusset. Next round: Work in pattern to first marker; slip Thumb Gusset sts to scrap yarn for holder. CO 3 sts to bridge thumb gusset as indicated on chart, using the long-tail method, treating the working strand of MC as the ball end and the working strand of CC as the tail end. 69 sts on needles. Work as set until hand chart is complete. 24 sts rem. Close top of mitten with Kitchener stitch. Plot initial of choice (see Alphabet Chart) onto blank thumb chart within space indicated by box. Rejoin yarns, and return held thumbs sts to needle. Work from Thumb Chart for appropriate mitten, working the first two picked up stitches from the cast-on stitches over the thumb hole, and the next 2 in the fabric of the adjacent selvage, and picking up the first two of the final four in the fabric of the adjacent selvage, and the final 2 over the cast-on stitches over the thumb hole. 34 sts. Work as set until chart is complete. 16 sts rem. Close top of thumb with Kitchener stitch. Weave in ends on WS. Soak and gently block, taking care not to stretch ribbing. Allow to dry completely before wearing. 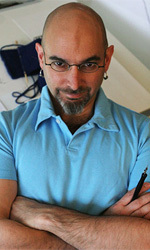 Franklin Habit is the proprietor of the popular knitting blog, The Panopticon, and author of It Itches: A Stash of Knitting Cartoons (Interweave Press). Those are his initials on the sample mittens; because flowers or no flowers, after all the agita of knitting the damned float-ridden things, you bet he's going to wear them.